If you look closely at the tank in this image, you will notice that it is covered with hexagonal-sectioned armor. The purpose of this honeycomb armor is that they dynamically adjust their heat emissions. This is BAE Systems Adaptiv armor system that allows vehicles to disguise themselves from infrared scanners. I’m sure you have seen how infrared cameras are used to see in the dark, as objects with heat look lighter than their cooler surroundings. The Adaptiv armor is able to disguise by making a tank or other vehicle look like something less threatening like an animal. It does this by adjusting the temperature pixels on its shell. It can even make a tank disappear, and you can see (or not see) it for yourself if you click on the Source link. This is the Oggboard, and the “Ogg” is short for augmented reality. The Oggboard combines traditional turn-based strategy games with augmented reality, a nifty piece of technology that I have reported on more than once, for sure. The board has a simplistic yet unusual design where each user places his or her smartphone to view the specially made tiles. This board folds up easily for compact storage. You can watch the video after the jump to see that the phone’s view creates lifelike game avatars that battle each other out. What you are about to see in the video after the jump is known as Seamless Computing, and it really is where we are headed, as far as technology is concerned. The demonstration is courtesy of a company known as Nsquared, and it shows how a Windows 7 Mobile Phone, Kinect, and Surface can work together. As far as I know, Microsoft did not sponsor this in any way. MIT Media Lab showed off this particular CityCar at a conference lately, and it is very good. Just to let you know, it is still a concept, but it should be full-sized and in production in about 2013. You can watch a video of it after the jump, and you can see that it has a very unusual folding ability. The folding is perfect for city parking places, where space is an issue. Just think how much less room these cars would take up in comparison to full size cars of today! The folding also serves a secondary purpose as it allows the driver to get into the car standing instead of that acute or obtuse angle that one does when getting in the driver’s seat of ordinary vehicles. We all know that we make a lot of kinetic energy just by moving around, and we all need energy to power our mobile devices. This is why researchers at the University of Wisconsin in Madison are working on a harvester that stores all the energy that we create by strolling, running, or walking. Tom Krupenkin, a UW-Madison associate professor of mechanical engineering, says that human beings generate a kilowatt of power while sprinting. That is more than enough to power laptops, flashlights, and mobile phones. It seems like just yesterday that I was reporting on some advancement in Augmented reality. Actually, wait, it was yesterday. Today, it is an augmented reality mirror. It involves making a 3D map of your face, so you can make tweaks on your own reflection. You can watch a video of it after the jump. The first time I watched it, I could not see much of a difference between the image on the left and the image on the right. However, you really have to look for subtleties. Yes, this cool-looking aircraft doesn’t exist as yet. This is the Oliver VTOL (Vertical Take-Off Landing), and it has six engines instead of the usual three of a jet engine. Some of you might be wondering how such a vehicle could land. This is because you are seeing it from the front-facing view. If you could see it from the side, then you would know that the “top” and “bottom” propellers are at about the same level as the middle propellers. There are two propellers in the back and two in front that can swivel upward so the plane can take off without a runway. Apple has a nice peripheral for the iPad and iPhone with their wireless Bluetooth Keyboard, but you really need your iDevice to be at the proper angle if a keyboard is going to be any use. This is where the WINGStand comes in. It can attach the iPad or iPhone to the keyboard. That might sound like a simple piece of plastic, but in the gadget world, little things like this can do a lot. I don’t know why Apple’s wireless Bluetooth keyboard doesn’t have something like a Wingstand on it already. What were users doing before, leaning their iDevice against a wall? What you are seeing here in this photo are Wearable Privacy Shells. I believe that the purpose of this device is to shield out the rest of the world for at least a few moments. I am guessing that a few moments of peace is all that you will get as everyone will be looking at you after that. However, I have seen situations where people ignore the strangest and most unusual things. Just go to a big city and you’ll see all kinds of people that people just walk by every day. You will notice that this Privacy Shell is designed for two people, but there are Privacy Shells that cover just the face, or just the eyes. You can see more at my Source link after the jump. Now that the Space Shuttle program has been essentially grounded, it is time to start thinking of new ways to leave the atmosphere. Virgin Galactic may be banking on expensive trips with space planes, but this is the first time that I have heard of traveling to space via balloon. 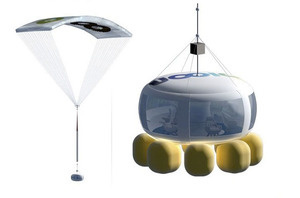 This lighter-than-air spacecraft, the Bloon, will reach 22 miles (36 kilometers) into space. That is enough to see the curvature of the Earth, but not enough to float the passengers with zero gravity. Check out the video after the jump to see what it might look like.